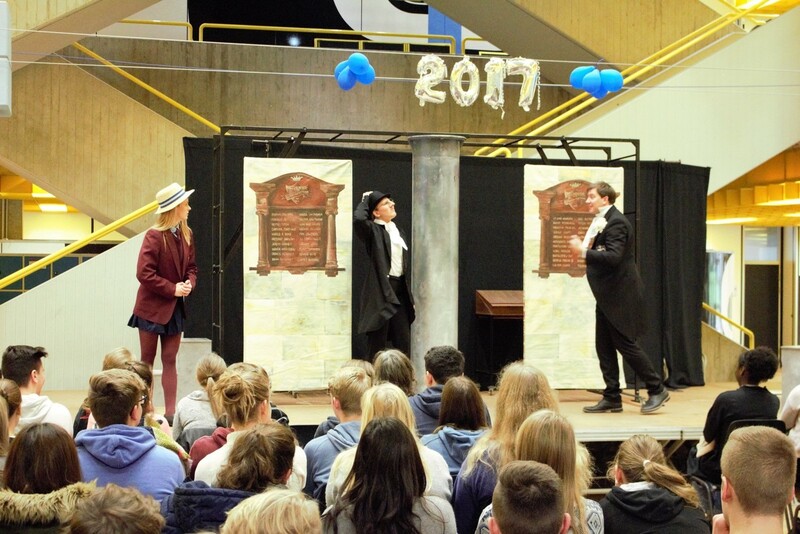 On Wednesday, November 8th 2017 120 year eleven students of Berufliche Schulen des Kreises Stormarn had the pleasure of watching White Horse Theatre’s interpretation of Shakespeare’s popular comedy play Two Gentlemen of Verona in the main hall of the school. It features conflicts between friendship and love and revolves around the rollercoaster-feelings young people have to deal with. The play, Two Gentlemen of Verona, by William Shakespeare (1589-1593) was rewritten into a modern version in simple English by Peter Griffith. 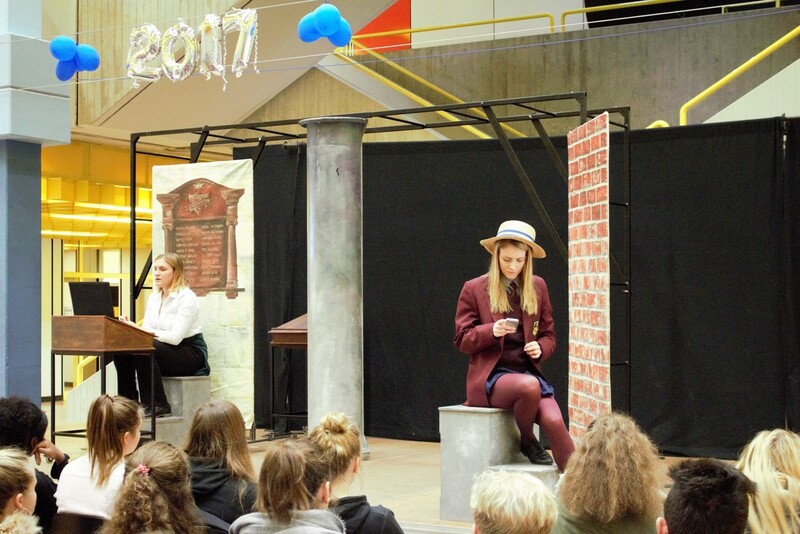 The White Horse Theatre performed this drama at our school on November 8th. The plot deals with love, friendship, infidelity and betrayal and the foolish behaviour of people in love. The main characters are Vincent, Piers, Julia and Sylvia. Vincent and Piers have known each other their whole lives. However, all of the sudden Vincent is sent away to boarding school. As a last favour, Piers asks Vincent to deliver a love letter to his secret love Julia. Piers and Julia start a relationship and life seems to be perfect. But Piers´ father has a big surprise for his son: Piers gets to go to the same boarding school as Vincent. Before he leaves Julia and Piers promise each other to be faithful. On Piers’ arrival, Vincent introduces his friend to his girlfriend Silvia. Immediately Piers falls in love with her. Back home Julia is worried because she hasn´t heard from Piers since he has left. She finds a way to sneak into the boys’ only boarding school. Will she establish the truth about Piers? 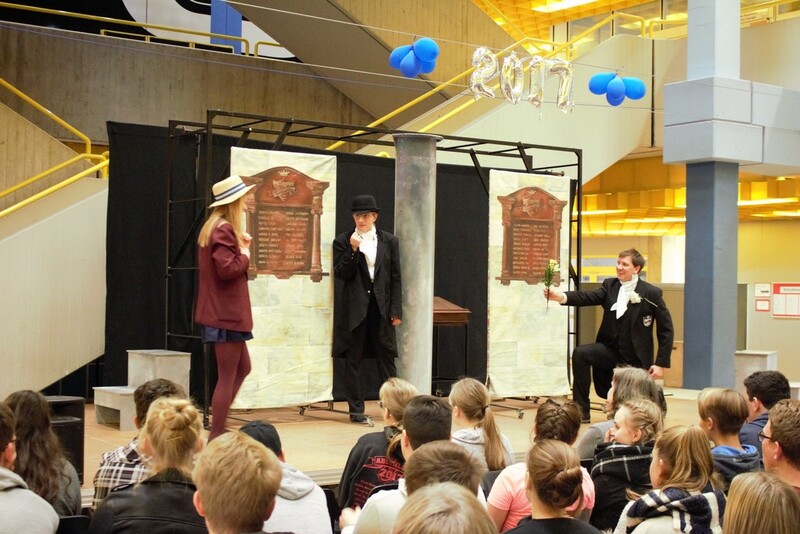 The play and the characters lead the audience through an energetic and fast-paced version of Shakespeare’s classic drama. The powerful music and the dynamic stage with its turnable walls and movable objects help to fill in the short gaps from one scene to another. The setting and the props are simple but practical and the actors use not only the stage but one actor even climbs through the audience for one scene in the play. That is very funny and entertaining. Each new scene is introduced by music which is a bit too loud at the start of the new scene but is turned it down after about 5 seconds. The play is in simple English. It is quite funny and easy to understand, as all actors speak clearly and loudly. There are seven characters in the drama, but only four people perform, so some of the actors have to play a second role. That is a bit confusing sometimes. The time the actors have to change their costumes is very short (just a few seconds), but they manage to do a good job. After the performance the actors and actresses were open for questions. We really liked that they took time to answer our questions about the life of an actor/actress on tour through Germany. 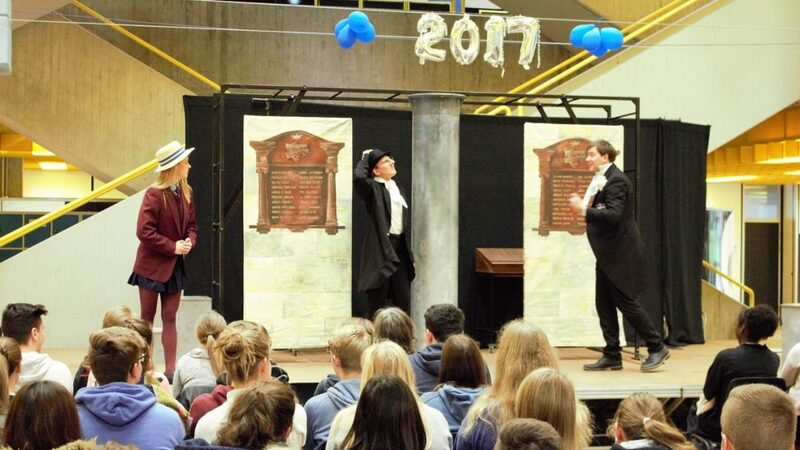 All in all, we would definitely recommend this play by White Horse Theatre to other schools, especially because the end is more realistic than Shakespeare’s version. Also it only lasts an hour so even younger students will pay attention all the way through.